Whew! I couldn't get into this blog! Google wanted me to use their acct email instead of Yahoo email that I usually use. It gave me a couple of bad moments but I'm here! E-bay sales went real well today. Only one thing didn't sell and it's the pin that I like the best! It wouldn't be too bad if I had to keep it. I reposted it and we'll see how it does this time. Everything that's paid for is packaged up and ready to go in the mail tomorrow. It really is a good system. 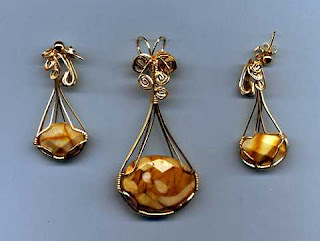 The picture shows a wire wrapped pendant and earrings that I did at William Holland Lapidary Arts School last September. I called work today and got my schedule for the first two weeks back in NY. I'll be working more this year (just for the six weeks that I'll be in NY) because it's big vacation time. I got some bad news about people I know but I can't go into that here. Dialysis is a strange field for a nurse. You get really close to the people that you take care of and it's really hard to let go. That's why I go back each year. I don't want to let go of all those long term relationships that I've made over the 18 years of working there. It will be good to see everyone come July! It's almost time for Jackie and Sean's wedding! Just a week and a half until that big day. The family is starting to gather here in Florida. Bill comes in with his family on Saturday night, Liz with her's on Wednesday. Nick and Nicholas are flying into Orlando on Friday and going directly to the hotel when Mary & Oliver pick them up at the airport! This will be the first time the whole family is together since 1999. My brother and my other niece, Danielle, will of course be there. The only sad thoughts will be how much our Mom and Dad would want to be there! They both loved Jackie so much. I'm sure they will be with us all in spirit! I forgot to post the picture! 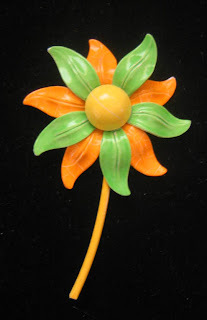 This is one of the items that I put up on e-bay today. Today I met with a friend and had breakfast with her. Some articles that I put up on Freecycle.com were picked up. That's a great site for getting rid of things when you're cleaning out your house. If it's something that's too big to ship or something that you just aren't interested in trying to sell and you just want to get rid of Freecycle is great! 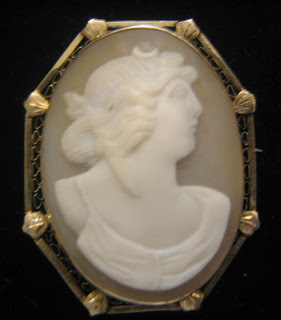 A good deal of my time, today, was spent putting vintage jewelry up for sale on e-bay. If you're interested in vintage/antique jewelry (pins, cameos, bracelets and earrings) or just want to watch what I have for sale look up "Items for sale by seller gsmth390" on e-bay. It's fun to see what happens. Most of my items are only listed for three days. I don't want to have to be bothered shipping when Bill and his family are here. No jewelry making today. I did complete the necklace that I'll wear to the wedding. I'll post that picture tomorrow! We had a good class yesterday. I taught the wire-wrapped doughnut. While teaching I was able to make one of my own. 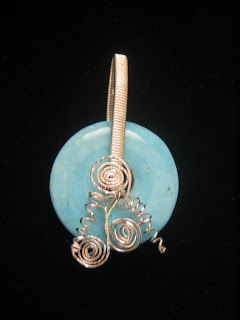 My granddaughter's birthstone is turquoise and she really love the stone so I made this pendant for her. 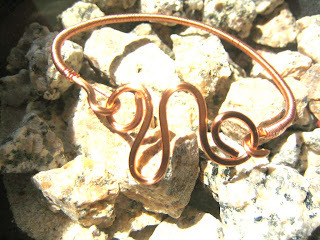 It is wrapped with sterling silver wire. It is reversible and it is a little more conservative on the reverse side. My student made a totally different pendant! Hers was made with a dichroic glass doughnut with a large hole. She did hers in 14k gold-filled wire and it came out just beautiful! Emma is coming here next week and I'm wondering whether or not to give it to her now or keep it for her December birthday. I'll see what she's wearing to the wedding. If it's something that will go with the piece I'll just have to give it to her now! I'm going to make a turquoise and silver chain to complement it. Well I'm off to teach another class now. Today we're doing a peyote bracelet made with different sizes of seed beads. I'm teaching this at Susan Barette's shop, Beads and Baubles, in Fort Pierce, FL. Tomorrow I'll post a picture of the finished product. Let me explain that the house across the street has been in the same condition since the hurricanes of 2004! It hasn't been pleasant looking across at the shredding blue roof blowing around the otherwise nicely kept neighborhood! No one lives there and I heard that the management is evicting whomever owns the house. Well today they finally started working on the house. Hooray! I was hoping they would tear it down cause that would give me a lake view from my front window but I think they will just fix it up and sell it. I made this necklace today. 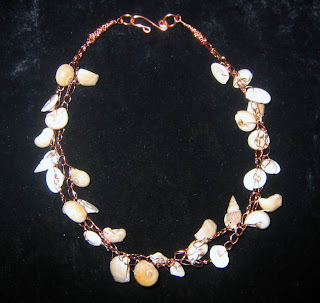 It's made with shell and crocheted copper wire. I hand made the cones and the clasp. The bead crocheting is fun! I'm very happy I was able to teach myself. Now I'll be able to teach it in Beads and Baubles in Fort Pierce. I'll be writing the tutorial, soon, and then put it as a free tutorial on my web site. Today was not bad. I taught a class today at Beads and Baubles in Fort Pierce. I always have a great time when I teach. The people that bead are so congenial. I taught the Byzantine weave bracelet. Dinner was with a friend at Norris' barbecue restaurant. Later was our HOA meeting and my second attempt at being secretary! I don't think I did too bad. It's fun and I'm meeting new people. Here's a technique that I taught myself this week. Wire crochet. I've been crocheting most of my life. I remember my cousin Jane and myself having competitions to see who could make the longest chain! 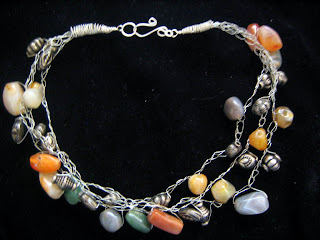 That's all this is.....three strands of wire with stone and metal beads crocheted in to the wire. The end caps are made from twisted wire wound into the tornado shape. 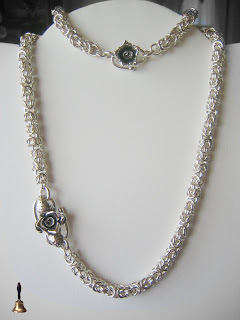 A hand made sterling silver clasp finishes it off. It was fun to make! It feels good around the neck, too. I'm teaching a class in Byzantine tomorrow. I love the look of Byzantine! I have to cut some rings for this today. Friday I'm teaching the wire wrapped doughnut! I'll take a trip to Sabastian to buy some wire for that class. I ordered some from Monsterslayer.com but I don't think it will get her in time for the class! Today's the day that I get to put $500 into my car! Friday at 3:30pm my car, a white 3 y/o PT Cruiser started making noises and smoke came out from under the hood. I immediately ran to the Chrysler dealership in Vero and they were nice enough to look at it and deem it undrivable until an intense tune-up was done. I had to leave it over the weekend. The dealership loaned me a car for the weekend and now I'm waiting for the call to go and pick it up! This came on the same day that I got a dental bill for $2000! A very expensive day! I'll have to sell a whole lot of my pretties to make up for this weekend! 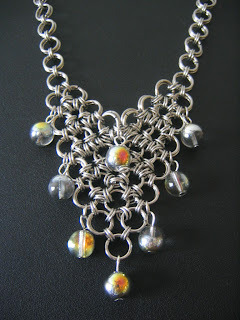 I'm crazy about making chainmaille jewelry! Here's an example of my work. 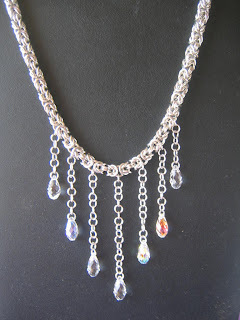 This piece is done in bright aluminum with Swarovski crystal dangles. You can see more on my web site. I'll be posting new items here just for viewing. I'm starting this on a day where I'm trying to organize my home! The shed is cleaned out (just about). It's difficult to break the habit of being a pack-rat! I had someone from Freecycle.com come and take the old clamshell shutters that have been cluttering up the shed for almost a year. I offered him the other stuff such as the curtain rods, hot plate, golf bag carrier, kitchen cabinet hardware but he wanted none of it. Too easy! Most of that is now on Freecycle and if no one wants them by the end of the week they will go in the trash! I hate throwing things out! Must be my upbringing. Waste not want not! Now I'll tackle the inside!